If you'd like to make yoga mat straps of your own, you'll be pleased to know that learning how to knit yoga mat straps is pretty easy. Yoga mat straps are used to carry yoga mats, rolled up, to and from yoga class. If your studio doesn't provide mats, or if your studio provides mats of a questionable hygiene level, you'll want to bring your own mat to class each time you go. An unrolled yoga mat is quite difficult to transport, and a rolled up mat needs some assistance to stay rolled up: knitted mat straps serve this purpose. Mat straps can be purchased for a nominal fee. In addition, some yoga mats come with straps. However, both of these options leave you walking around the city with the same mat/strap combo as several other yogis. Whether you like your things to be unique so that you can never confuse yours with someone else's, or you like appearing unique, knitting your own mat strap will ensure that nobody else has one even remotely like yours. Use your needles to cast on six to ten stitches. Generally speaking, the wider your straps are, the more they will stand out against the mat itself. Use two strands of yarn to cast on. Knitting all your rows, you should come up with a strap in the vicinity of one or two inches wide. Finish off the ends and fold any loose yarn into the ends. Lay the strap out on a table and measure thirty inches from each end of the strap. Mark the two points on a piece of paper under the strap. Using a plastic needle, also threaded with two strands of yarn, fold each end of the strap in so that the ends of the strap are exactly on top of the two measured points. Make sure there are no twists; a clean loop should be formed with this fold. Sew the ends onto the strap at the measured thirty inch marks. Your strap is ready to go! Roll up your yoga mat and place each end inside the two loops at the end of the straps. 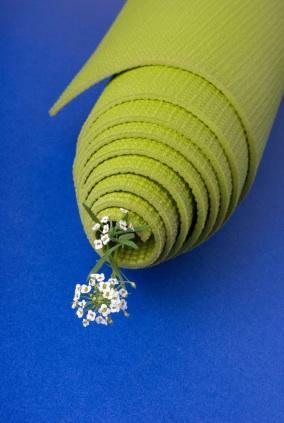 Using a simple knot, tighten the loops around the yoga mat at the desired thickness of your rolled mat. Since it's so easy to learn how to knit yoga mat straps, you can teach all your yogi friends in an afternoon. Alternatively, you can knit straps for each one of them in different colors that contrast with their own yoga mats, a gift that everyone will appreciate and love.